We all remember SmarterChild, right? That slightly uncanny and worryingly congenial chat bot? Well, for those of you who don’t know what a chat bot is, or haven't heard of SmarterChild – SmarterChild was the brainchild of Robert Hoffer, Timothy Kay and Peter Levitan, who created a personal assistant which was capable of retrieving and conveying a variety of information within moments, from current affairs to movies and weather. This was essentially a virtual person that you can direct message, who will respond to you with a releated answer - a fake friend on your instant messenger if you will. However, the easiest way to encapsulate SmarterChild in a modern context, would be as an earlier rendition of Apple's Siri, or Microsoft's Cortana, but without voice functionality. HubSpot has released something similar, though more inclined towards enhancing your marketing capabilities. It’s called Growthbot, a powerful marketing assistance bot which enables you to acquire a wide array of data, perform a number of marketing processes and obtain quick answers to what would have been an arduous research effort. Similar to SmarterChild, but far more niche and intricate, it’s capable of connecting to other marketing analytics programs such as Google Analytics and with an online publishing platform known as Medium. It operates through Facebook Messenger and signing up is relatively easy. Simply head over to: http://growthbot.org/, follow the registration steps and you’ll be up and running in no time. However, if Facebook isn't one of your messaging platforms, you can use GrowthBot via Slack as well. What’s truly great about HubSpot's GrowthBot is that it operates in tandem with your HubSpot portal, allowing you to locate data within your own analytics and request specific information – highlighting that it’s very much on its way to complete integration. This means that you can literally ask GrowthBot 'how many visits have I had today?' and GrowthBot will find the answer for you from your HubSpot data within seconds. What was my traffic last week / last month / last year? How many contacts did we add last month? But you can see some general commands below, which are provided when you ask GrowthBot for a 'hint'. There are a number of specific queries you can ask GrowthBot and you'll receive very concise answers. What are top articles on growth hacking? What software does hubspot.com use? What keywords does [insert website] rank for? What ppc keywords is [insert website] buying? What marketing software does [insert website] use? What ad networks is [insert website] using? Who are my top twitter followers? 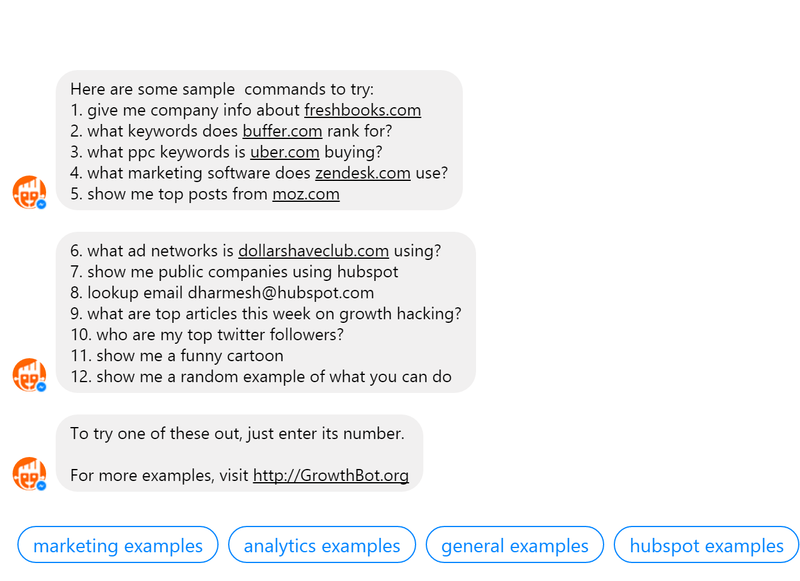 In addition, at the bottom of your chat window, you can request specific examples of questions you can ask GrowthBot, such as 'marketing examples', 'analytics examples', 'general examples', 'HubSpot examples', and 'random examples'. 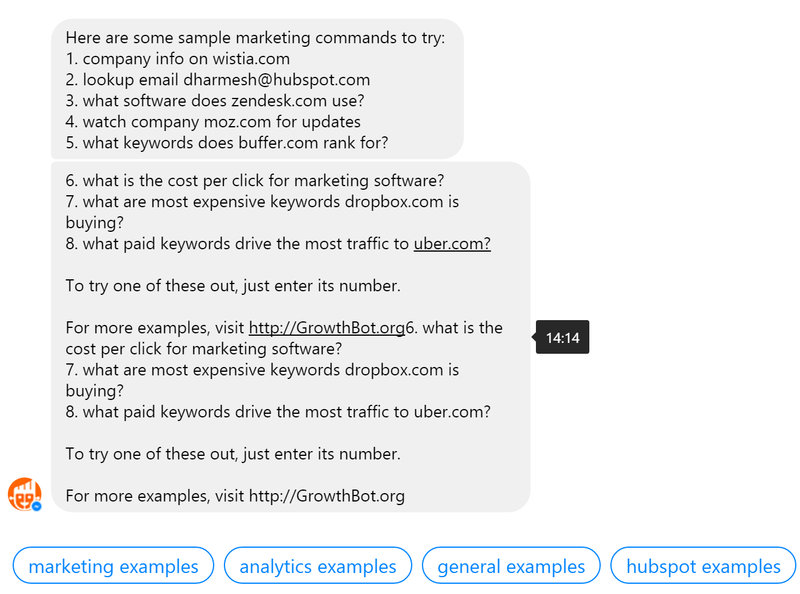 But you can already see the potential for HubSpot’s GrowthBot, from discerning what marketing analytics websites are using to advising you on the best businesses for a particular expressed desire. However, one thing to note is that due to it being a bot in its early development stages, you need to be awfully specific with your phrasing and how you construct your questioning, otherwise it won’t compute! 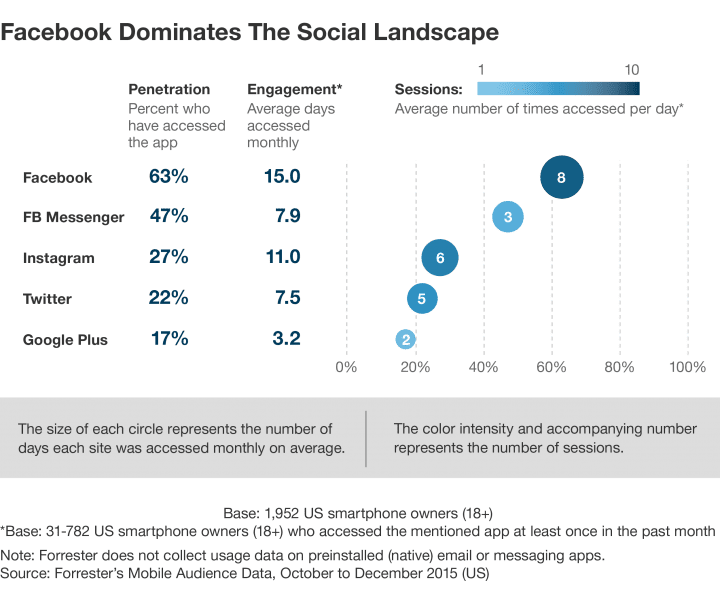 With an integrated chat bot available to you through Facebook (and let’s not forget, it’s the most popular social media platform) it could make marketing from anywhere, ridiculously easy. Like having a wizard by your side in times of untold darkness and despair, HubSpot's GrowthBot could be the magical maestro capable of astounding feats, or the Sage with limitless knowledge. 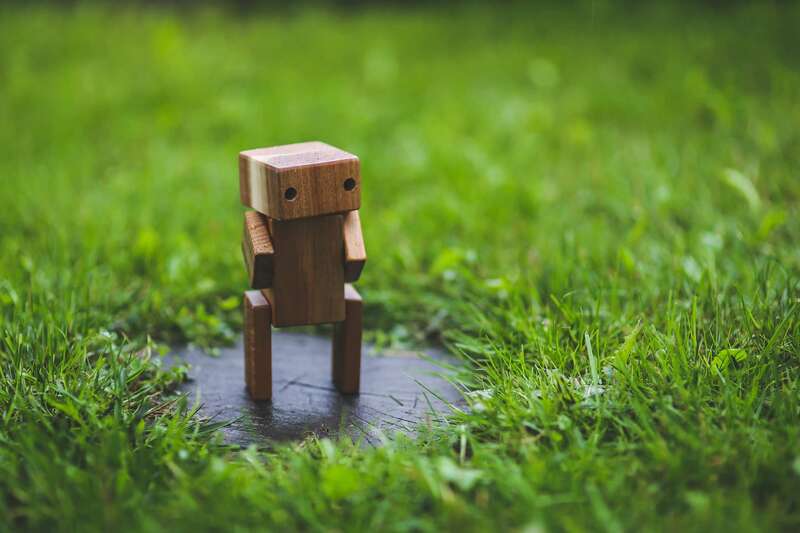 The projected potential of GrowthBot is limitless for marketers, from gathering information regarding a particular industry, to accessing data on the fly – it’s definitely one to look out for and integrate with your marketing efforts. Considering the continuous developments in technology and shifts in marketing efforts and perspective, it’s become increasingly evident that detailed and incisive information is key. Having an interface or incredibly intelligent intern (GrowthBot) at your disposal makes for deciphering that information a lot easier. As GrowthBot continues to grow, it has clearly conveyed how powerful and capable it is, and is gradually becoming a tool for all marketers that want access to data at the touch of a button. This blog post was first published in July 2016, but has been refreshed and updated in March 2017.